High-contrast fender cladding and a closed front grille differentiate the Kona EV from its internal combustion siblings. The Hyundai Kona full-electric crossover will end 2018 on a high note after receiving 7,000 orders just in Norway after its launch in July. "By the end of the year, we will deliver approximately 11,000 units in Europe," said Thomas Schmid, Hyundai Europe's chief operating officer. "Given the order level, we need to get from Korea three times as many cars to reduce the waiting time for customers from one year to three to four months." Waiting times for the Kona battery-electric version "are similar to those of other EV makers," Schmid said in an interview. Oil-rich Norway offers generous incentives for electric cars. Besides tax breaks, fees are waived on everything from road tolls to ferries and EVs can use bus lanes. A fifth of all new-cars registered in Norway last year were powered solely by a battery and cities have much higher penetration. 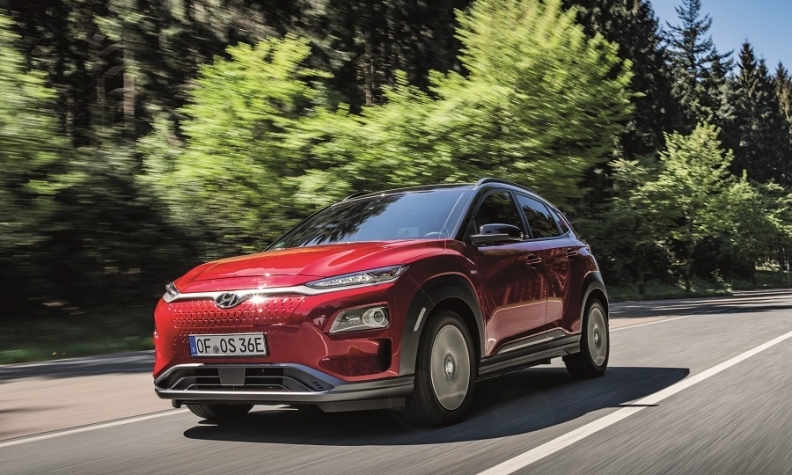 Schmid said the initial 7,000 orders in Norway for the Kona EV are equal to twice the number of Hyundai cars sold in the country last year. Despite the relative success of the Kona, Hyundai does not make a profit on EVs, as is the case for most of its competitors. “We make money in Europe, but as all other manufacturers, we have the challenge that we don’t make money on EVs,” Schmid said. "The scale is not there." So does Hyundai lack an incentive to sell more? "There is no financial incentive," Schmid said, "but the incentive is the brand reputation." Lee hinted at a possible solution to the scale problem: Hyundai's plan to introduce a platform for EVs. "As the volume of each EV is relatively small, by concentrating them on one platform, we might hope to make some money," he said. Hyundai said last year it was placing electric vehicles at the center of its product strategy and that it was developing its first dedicated EV platform that will allow the company to produce multiple models with longer driving ranges. Lee said the platform will encompass EVs of all segments, from minicars to large sedans, although with different suspensions. The first vehicle on this platform will be launched in 2020, he said. Looking at the European EV sale rankings by CleanTechnica, 11,000 units would have been good last year to give the Kona seventh place after the Renault Zoe, BMW i3, Nissan Leaf, Tesla Model S, VW e-Golf and Tesla Model X. The Kona reached its total in less than six months on the market.